Saucony’s marketing pitch: Deliver the full manifestation of Everun cushioning. Upper: Engineered mesh with integrated lace-loops, fused synthetic, plastic heel clip, inner sleeve. 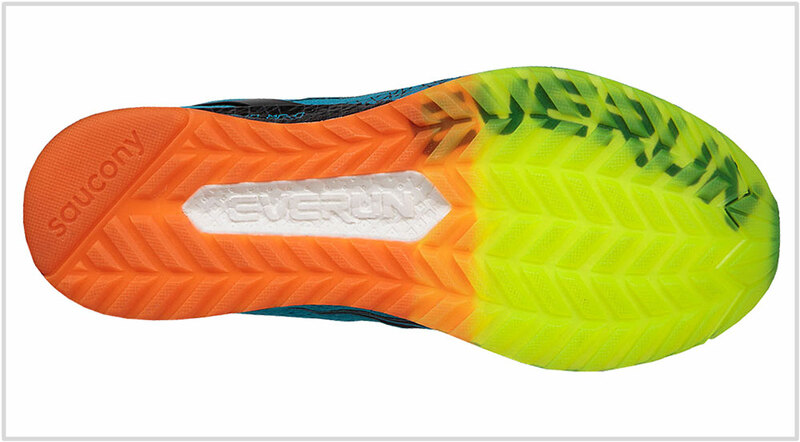 Midsole: Full-length Everun foam with topsole. 4 mm heel offset. Outsole: Hard, translucent rubber from heel to toe. Saucony takes the high road, and its first full-length Everun shoe delivers unadulterated performance and unmatched versatility. If you view the running shoe industry through a broad lens, it becomes quickly apparent that most models are grouped into familiar categories. There’s the evergreen ‘neutral’ category meant for shoes without medial-posts. Conversely, the ‘support’ or stability bucket is home to medial-posted shoes. Then there are multiple sub-tiers below and above these two categories. For example, you could have neutral or stability shoes which are more expensive and plush. Additionally, there are ‘fast’ and lightweight shoes meant for speedier runs. And last but not the least, there are thoroughbred racing flats meant exclusively for competition events. Once in a while, there comes a shoe which does not fit into any of the established categories. For convenience sake, the brand might officially slot it into one of the categories, but deep down you know that the shoe is a square peg in a round hole. The 2014 Brooks Transcend (which solereview liked a lot) was one such shoe; it was like a breath of fresh air in an industry defined by rigid taxonomies. The 2017 Saucony Freedom ISO is another of its kind. To be entirely honest, when we first heard about the Freedom, we assumed it to be a very different shoe. Solereview assumed that it was, in a certain way, a plusher version of the Triumph. Similar to how the adidas Energy Boost is a softer version of the firmer Glide Boost. Now knowing what we do about the Freedom ISO, it is hard to plug the shoe into a particular category. That’s simply because the Freedom ISO is so versatile that it defies convention. Let us illustrate our point with the following examples. 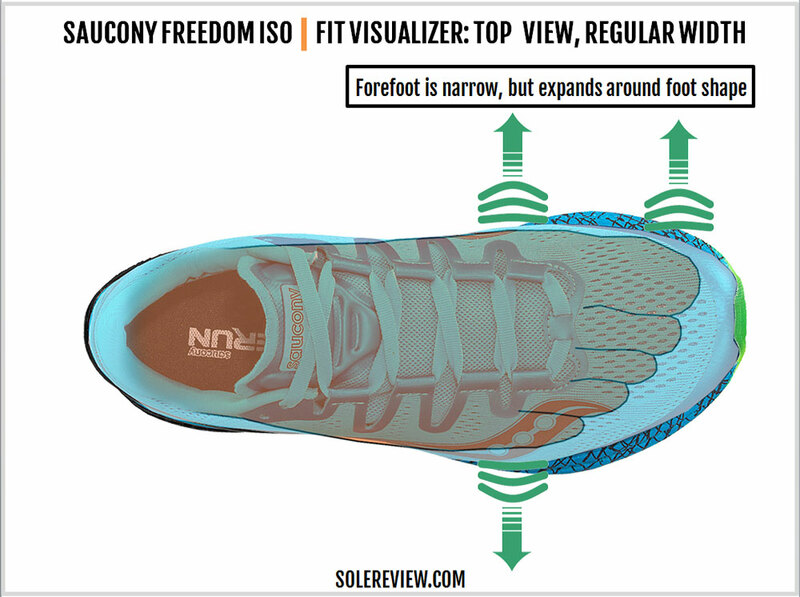 The Saucony Freedom ISO has a midsole made of full-length Everun. So this shoe should ride plush and soft like an adidas Ultra Boost, correct? Wrong. The Freedom ISO is much firmer than the Ultra or Energy Boost. Ok, then the abundance of cushioning makes it suitable for long and easy runs, no? Yes, but you also can use it for faster workouts. But isn’t a full-length E-TPU sole heavy? 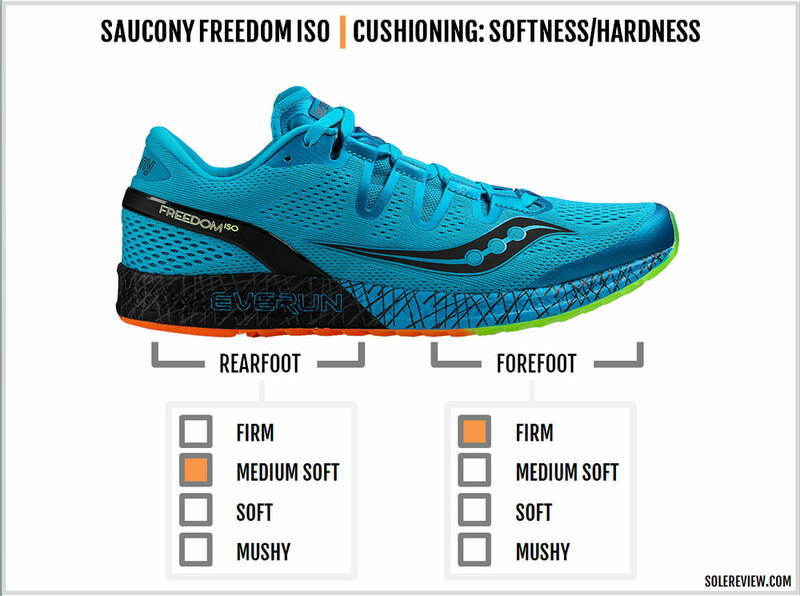 Nope, the Saucony Freedom ISO just weighs 255 grams or 9 ounces for a half pair of US 9. And oh, the Freedom ISO has a static heel-offset of 4 mm. By now, you must have realized that the Freedom isn’t your regular running shoe. The firm ride and minimal weight belie the full-length Polyurethane construction while making the shoe extremely versatile. The Swiss-Army knife analogy is apt here. 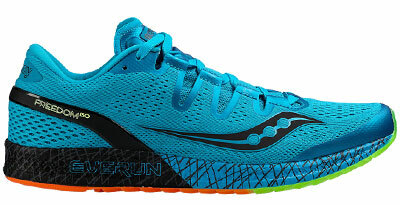 Saucony new $160 shoe (named after the 1983 Freedom Trainer) is a versatile, multi-faceted tool for many occasions; it is lightweight, compact and possesses sharp handling characteristics. 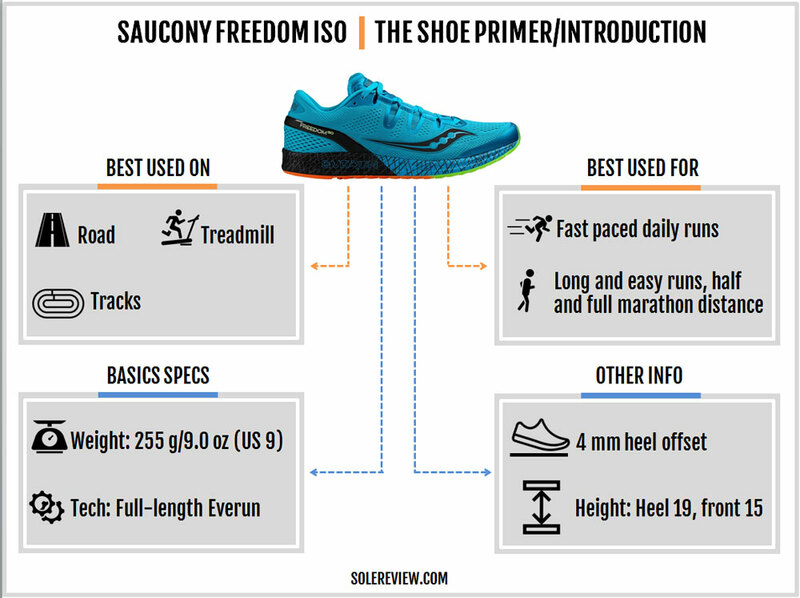 Unlike Saucony’s Everun topsole-only construction which is more of marketing gimmick than performance, the Freedom ISO means serious business. We have to give credit where it is due; Saucony deserves kudos for making its first full-length Everun shoe a pure-play performance kind. It is easy to get lured by adidas’s success of double selling the Boost platform. Even in the face of Saucony’s not-so-stellar sales in 2016. On a related note, what are the other brands going to do without the expanded polyurethane midsole? Saucony was quick to roll-out its Everun platform last year, undoubtedly inspired by the runaway success of adidas Boost. These two variants (Boost and Everun) of Polyurethane give Saucony and adidas a superior and undeniable competitive advantage. At the time of writing this review, there does not exist an EVA or Gel based foam material which is even close to matching the expanded Polyurethane’s functional and sensory benefits. At the same time, this advantage isn’t defensible either. The e-TPU material is supplied by a third party, which means that any brand who blinks first and eats humble pie can jump on this platform any time they wish. It appears inevitable that other brands will need to invite a few BASF (suppliers of the e-TPU foam) executives for lunch sometime in the near future. This chart is presented in an ‘also consider’ spirit rather than the standard template we follow for our reviews. Given its crossover personality, it is hard to plonk the Freedom ISO into preset categories like mid-weight neutral or stability. Sure, its medial-post free midsole design would classify it as a neutral shoe, but that alone doesn’t define a shoe, does it? The Freedom ISO is a veritable buffet of fit and ride character. At some level, the Freedom feels a bit like the Boston Boost. When viewed from another perspective, the 4 mm drop is straight out of the Kinvara territory. And when you consider the full-length, yet firm Everun cushioning, then the adidas Glide 8 Boost comes to mind. That’s true for the upper too. Certain parts like the heel fit feel similar to the Kinvara’s design, but the rest feels alien to Saucony’s existing line-up. Instead, the upper fit character is a vague reminder of the New Balance Fresh Foam Zante V1. Many of the Freedom ISO’s features appear at odds with one another, and we say this in a good way. The Freedom has a minimal, but comfortable upper attached to a low midsole stack and yet, it delivers a superior quality of cushioning without compromise. You know those optical illusions which adapt to your perspective? The Freedom ISO is exactly like that. No matter which way you view it, the shoe makes sense. For this reason, this comparative infographic should be used solely as a frame of reference and nothing more. Take it with a large grain of salt, as they say. The Saucony Freedom ISO is based on a brand new upper template designed from ground-up. The product description has familiar sounding marketing buzzwords like the ISOFIT, but the design is completely reinterpreted for the Freedom. Unlike previous ISOFIT examples where a separate panel was affixed to the outer mesh, the Freedom has the ISOFIT system integrated into the upper. The outer upper is made of a single-piece (except for the heel area), engineered mesh with a slight amount of elasticity. Being an engineered mesh, the forefoot top has holes for ventilation while the rest of the surface has a relatively denser structure. Most of the lacing happens through broad speed-loops which are a part of the mesh upper. The tongue is attached to an inner sleeve which is separate from the outer mesh; the latter simply floats over the sleeve. With its raw flap edges, the tongue has a deconstructed design when compared to most running shoes. If you even have the slightest concern about the raw edges being uncomfortable, then unfurrow your eyebrows immediately. These raw edges with interlocked stitches are done perfectly, as the material is very soft and completely non-irritating. Inside, the tongue has a lining with a meager amount of foam packed within. Most of the structure on the upper is provided by fused laminates. The toe-bumper has one, and so do the lace-loops. The fused urethane around the lacing area not only provides support but is insurance against fraying too. There’s a small difference between early Freedom ISO samples and the final production version. On the earlier samples, the entire tongue had a foam-padded piece made of molded glossy synthetic fused over it. On the retail version, only the flap area near the tongue top has this. 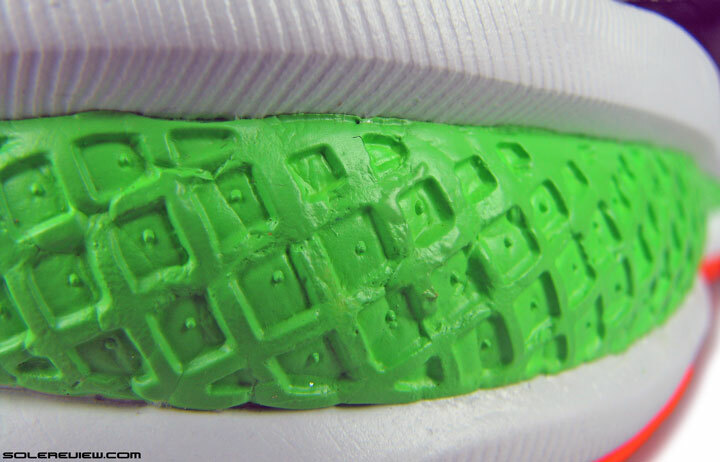 Only the outer heel uses a piece of hard TPU. There’s a thin plastic clip which wraps around the heel; this feature makes up for the lack of an internal heel counter. The heel lining is minimally padded, similar to how the Kinvara does it. The upper is the result of a design process which sought to keep the Freedom ISO’s weight low. Volume for volume, a polyurethane midsole weighs more than an EVA (Ethylene Vinyl Acetate) foam based midsole. Hence, Saucony has tried to shave as much bulk as possible from the upper. As a result, the Freedom ends up weighing just a shade over 9 ounces. Even with apparent design editing, there are elements of details over the Freedom. The heel and tongue top have slightly reflective trims, and both sides of the midfoot have no-sew Saucony ‘Runbird’ logos. And let’s not forget that the Freedom is bottom heavy – not just in actual mass but in terms of the visual impact as well. All the Saucony Everun models we’ve seen thus have only put the TPU material to partial use. We’ve reviewed Everun topsole-only shoes like the Ride and the Guide, and also models with both the topsole and the crash pad – namely the Triumph and Hurricane ISO. 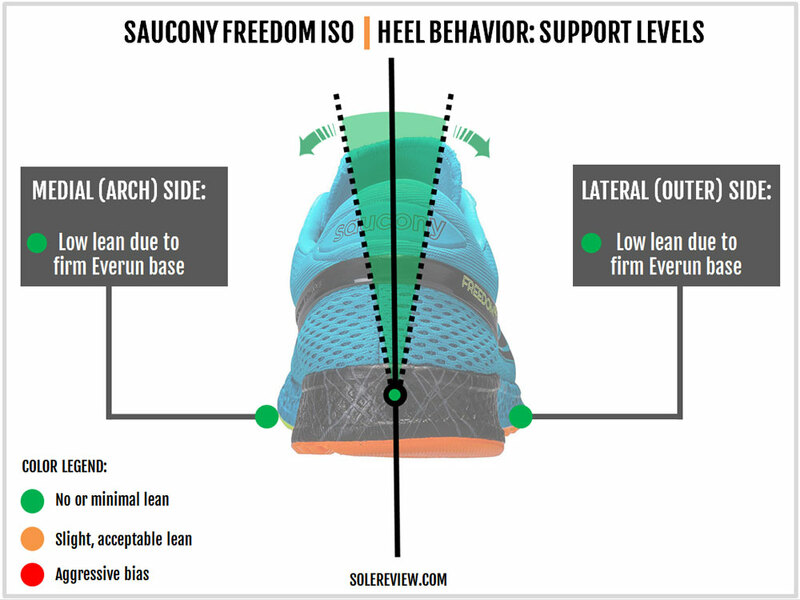 What makes the Freedom ISO special for Saucony is that the entire midsole is made of the Everun material. As an industry concept, this is hardly news though. Most adidas running shoes feature a full-length Boost midsole, which is made of the same material as the Everun, but only softer. The Everun might share an identical composition with the Boost, but there are two differentiating factors. The first is that Saucony molds the Everun into a more traditional shape, instead of the Boost’s Styrofoam-like texture. The Freedom ISO’s midsole sidewalls have a waffle-like molding throughout, and if you turn the shoe over, you’ll see the ‘Everun’ text embossed into the foam. Even the Triumph ISO’s heel crash pad adopted a similar design approach. And it is perhaps the molding which makes the Everun firmer than the typical adidas Boost midsole. It is almost as if a standard Boost midsole was put in a vice and compressed, with the resulting midsole being the tighter-packed Everun. Just like the Triumph ISO, Saucony paints the Freedom’s Everun midsole. On the reviewed color, the midsole has a color-blocking of blue and black, with the heel paint serving as a visual extension of the plastic heel clip. Furthermore, the color-block is painted over with an effect which resembles brush strokes. So yes, plenty of detailing on the sides. 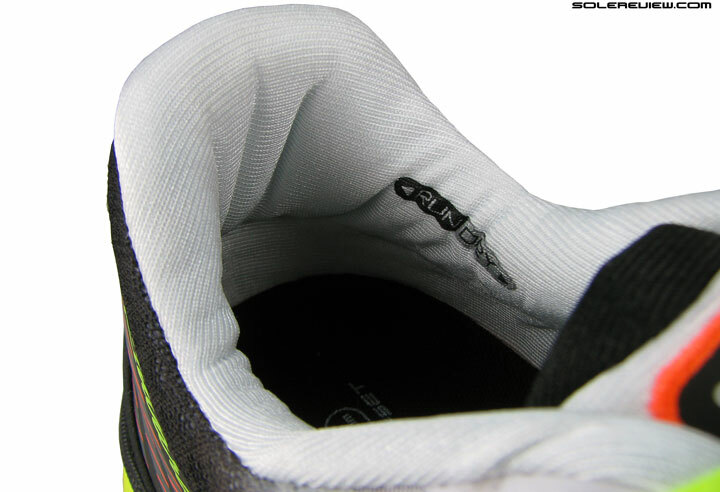 For its outsole, Saucony uses a single sheet of rubber underneath the Everun midsole. Except for a small portion under the midfoot where you can see the Everun’s true (white) color, the outsole is a full-coverage kind. 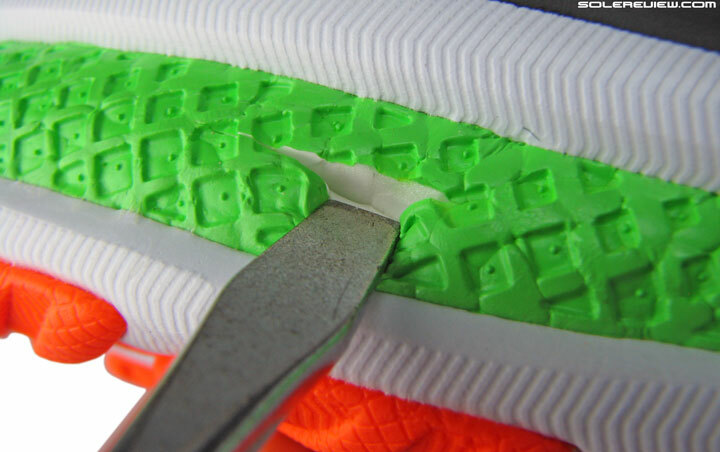 In a departure from most Saucony shoes, the entire outsole is made of a translucent hard rubber. No soft blown rubber has been used here; small triangular lugs (Triflex) are molded into the outsole for grip. which is an area where the Freedom performs well. The stack heights of the Everun midsole doesn’t seem like a lot. It is only 19 mm thick in the rear and a Spartan 15 mm under the forefoot, but you need to account for the additional layers of the Topsole and insole. 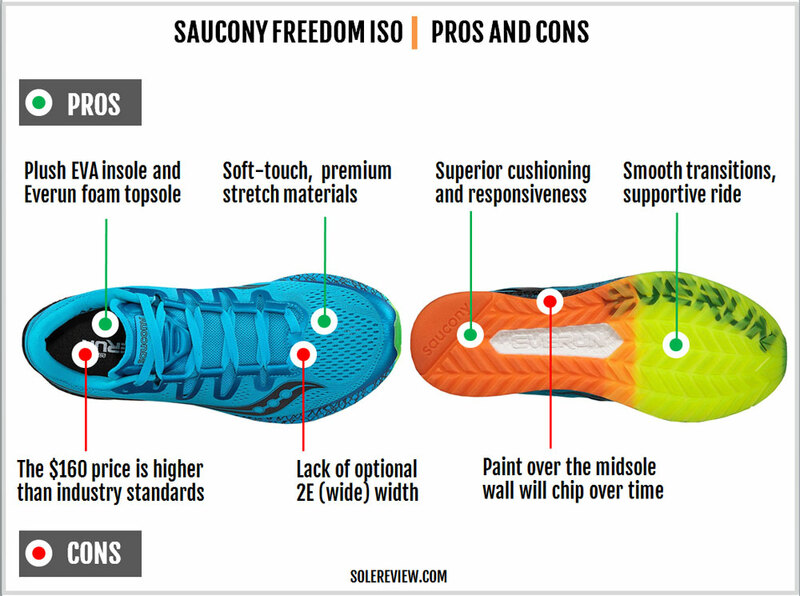 Like all Everun-infused Saucony models, the Freedom ISO also comes with a topsole. 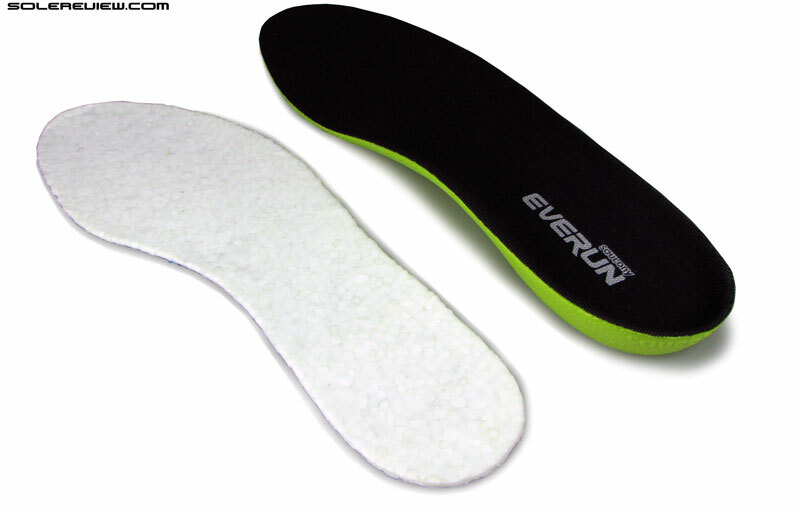 This is a thin sheet of Everun between the removable EVA insole (above) and the midsole (below). That’s another 3 mm of Everun, so the combined stack is more like 22 and 18 mm, not counting the EVA sockliner. 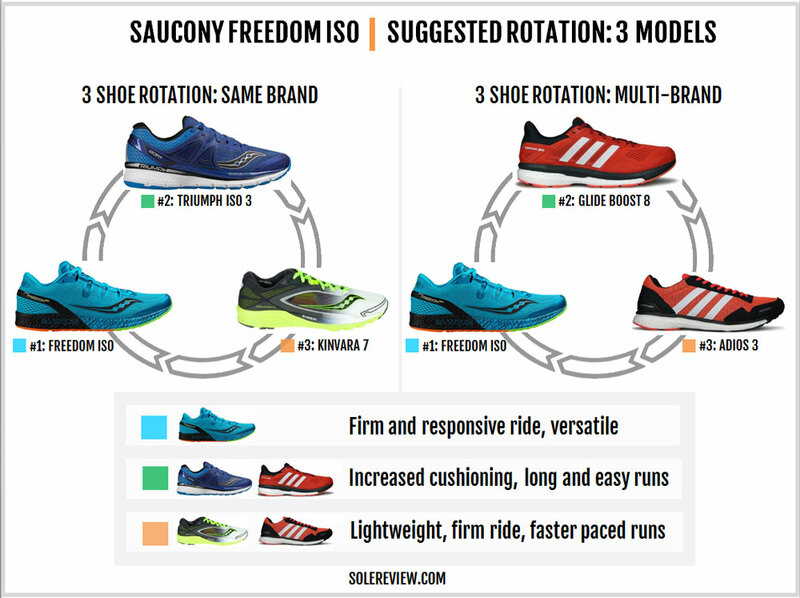 The Freedom ISO should last slightly longer than Saucony models such as the Ride, Guide, and the Triumph. The outsole is made completely of hard rubber, as opposed to a hard/soft rubber configuration. On a side note, one of our reviewers commented that the translucent rubber (and its small lugs) makes it a bit hard to track the wear-and-tear pattern on the outsole tread. As far as the Everun midsole is concerned, its cushioning integrity will outlive both the outsole and the upper. The mesh upper has no weak areas; wear and tear if at all, will probably happen around the forefoot or the heel lining area. You should be able to squeeze out around 400 miles out of the Freedom ISO, probably more. We’ll update this section as we receive more feedback. The toe-box ceiling is low due to the fused-over bumper, but far from toe-crunching shallow. While it doesn’t have the vertical space of a regular shoe like the Ride or the Triumph, you should have no problems. A good analogy would be the New Balance Zante V1’s toe-box height. 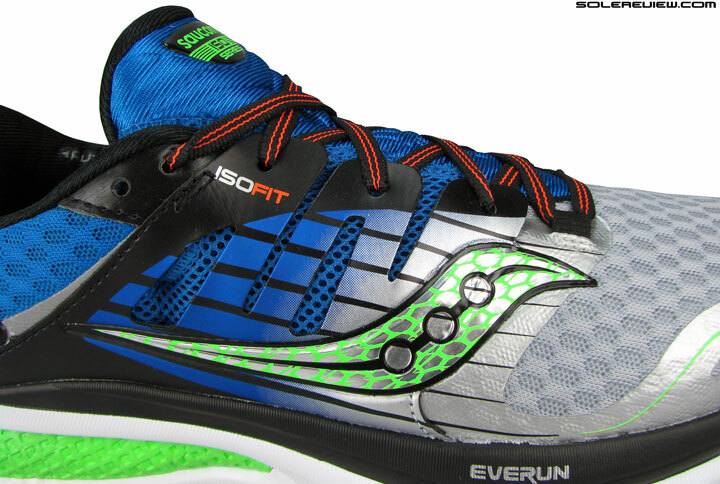 The Freedom ISO’s midfoot fit is excellent – easily the best ISOFIT experience till date. The past few years had been a struggle in getting the whole ISOFIT design to work flawlessly, and the Freedom’s integrated strapping system is the solution. The unified construction eliminates any pressure points, and as a result, the sock-like fit is secure and comfortable. There are soft and semi-elastic materials abound, and that elevates the comfort level of the Freedom ISO. The laces are a flat and elastic kind, which blends in with the overall material package. The heel fit reminds us of the Kinvara and the Zante. The foam-padded lining grips reasonably well as the Achilles point is curved slightly inwards. The lacing panel has a last eyelet in case you need to dial up the heel fit. It appears that Saucony has borrowed not only the Boost concept, but also the smaller sizing which is typical of many adidas shoes. 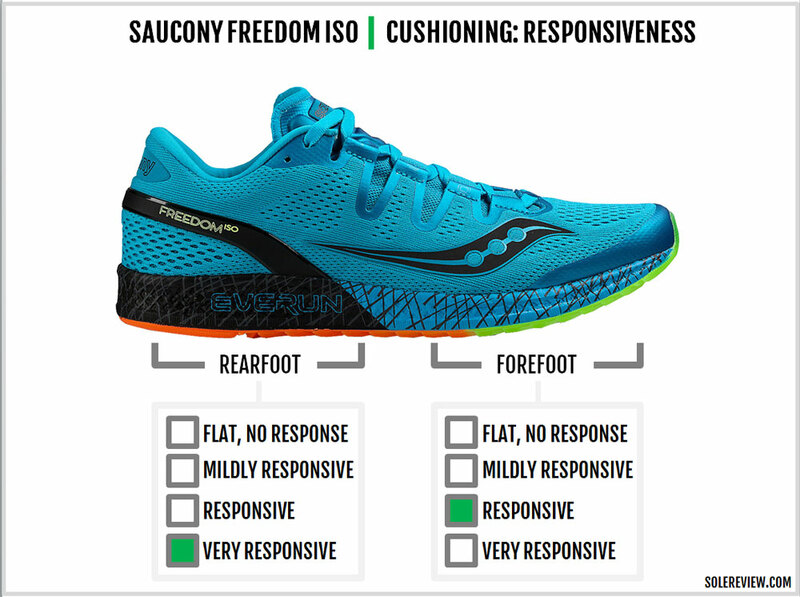 In what’s a notable departure from Saucony sizing norms, the Freedom ISO fits nearly a half size smaller than its peers. One theory is that the shoe uses a brand new last to accommodate the full-length Everun midsole, which affects the fit. The more likely explanation would be the plastic heel clip and the prominent inward curving of the Achilles heel. The difference becomes clear when you compare this to the Kinvara’s heel design. 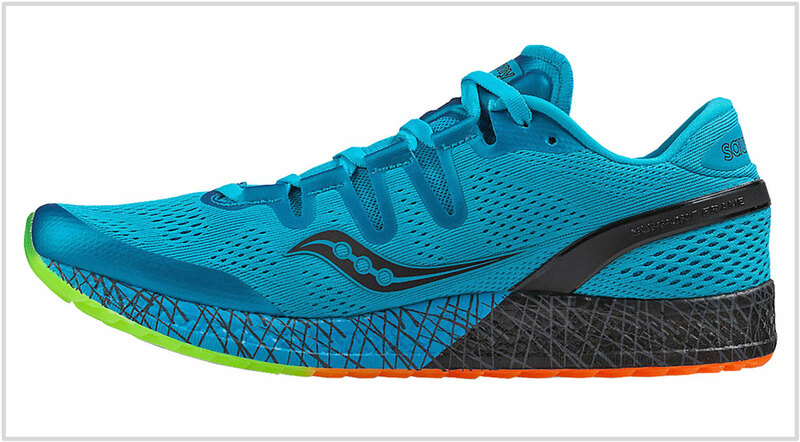 While the Kinvara goes relatively straight up on the Achilles, the Freedom ISO’s heel slopes forward. This creates the paucity of toe-box space we just described. So the bottom-line is, go a half size up on the Freedom ISO if you’re used to the regular Saucony fit. The forefoot is narrow yet not uncomfortable. This is another fit aspect of the Freedom which feels like the original New Balance Zante, just without the pressure hot spot. The Freedom ISO’s forefoot has a certain amount of stretch, which helps increase in-shoe comfort. One way to increase width and toe-box space without up-sizing would be to yank off the Everun topsole and go with the insole alone. But that will have obvious (and negative) consequences on the quality of heel fit and the ride, so why go down that road? On a general scale, the Freedom ISO has a medium-soft heel and a firm forefoot. This isn’t to say that the Freedom ISO lacks cushioning. Softness isn’t mutually inclusive with cushioning, though these terms are often used interchangeably. 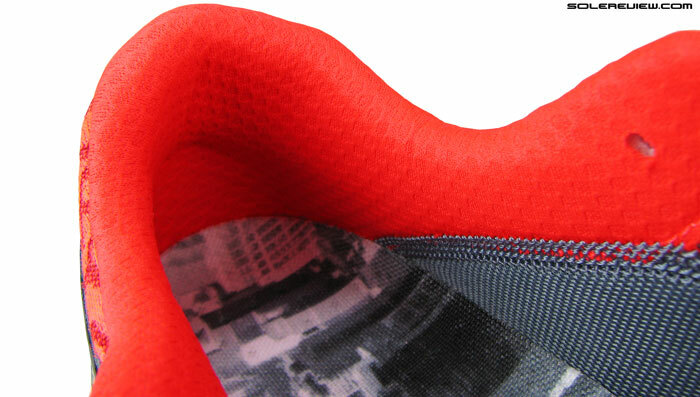 The densely packed feel of the Everun foam produces a firm and resilient ride character without any trace of mushiness. There is abundant cushioning material in the form of the Everun topsole and the midsole, except that there’s not a whole lot of give or compression. The behavior is more responsive, which is defined as the quality of a material to bounce back after being compressed. The quicker the foam returns to its original state, the more responsive it is said to be. For comparison sake, the Freedom ISO feels a bit like the adidas Glide and Boston Boost mixed together. As a stand-alone cushioning material, the Everun is firmer than the similarly composed Boost foam. But if you threw in firm EVA with Boost – as is the case with both the Glide and the Boston – the Everun starts feeling close in ride behavior. A way to put this is that the Freedom ISO shares the firm ride of the Boston, but has the cushioning depth of the Glide. And the Freedom does not feel like rimless adidas Boost shoes (like the Ultra), which are way softer in comparison. The Freedom’s ride is somewhat firm by industry benchmarks, and yet there is plenty of cushioning for all kinds of workouts. The firm feel makes the Freedom suitable for faster paced workouts on either track or road. At the same time, the superior quality of the Everun cushioning can take you up to a marathon distance. Over longer runs though, the firmer forefoot might have you wishing for a more cushioned platform. But at no point does the cushioning bottom-out like regular foam. Besides, the firm tinge in the Freedom’s ride is also the result of a single piece outsole which isn’t segmented into separate pieces. For instance, the Triumph ISO has multiple pieces of rubber mounted on the foam, allowing them to flex during runs. 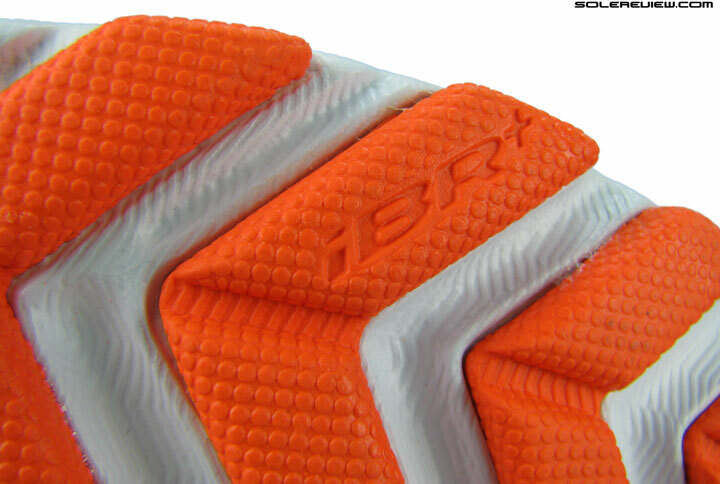 What also matters is that the Freedom ISO’s outsole does not have a softer blown rubber forefoot. Considering that the material between the EVA insole and the rubber outsole is nearly 100% Everun, the ride is very responsive. The inherent firmness also adds to the resilient feel of the Everun material. With every footstrike, you feel the midsole recovering quickly from compression, a trait which identifies with superior responsiveness. The responsive nature of the midsole performs unfettered without an EVA rim of any kind, so it’s a different experience compared to running in adidas Boost shoes. The Freedom ISO has a distinctive snappy ride quality with no mush. The heel-to-toe progression has a smooth and uniform feel to it. This is helped by a single material stack through-out the midsole length. Forefoot roll-offs also feel efficient, which is the outcome of a firm and thin forefoot combined with the outsole design. Flexibility is just right, and the forefoot is neither too pliable nor too stiff. The Everun foam is more flexible than EVA, but the firm rubber outsole keeps excessive flexing in check. 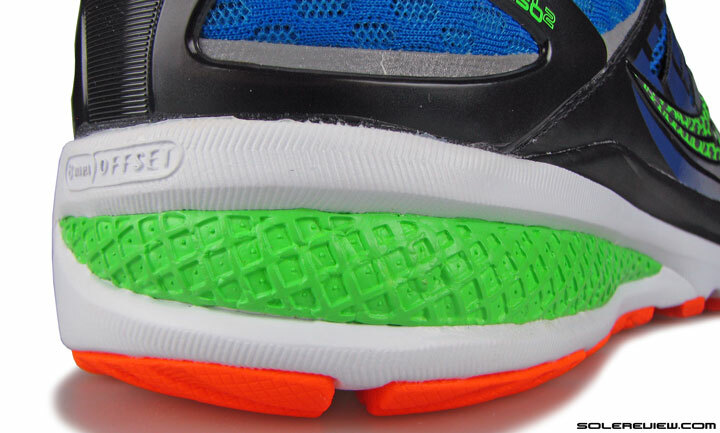 The Freedom ISO’s 4 mm heel offset is an indicator of the shoe’s positioning as a serious performance shoe. While the industry average for heel-offset is around 9 mm, the 4 mm drop might take some getting used to if you’re switching over from a 10 mm shoe. Usually, that manifests itself in the form of a mild Achilles/calf muscle soreness which dissipates with time. The rearfoot is supportive due to the firm Everun base, with minimal compression bias over the heel. 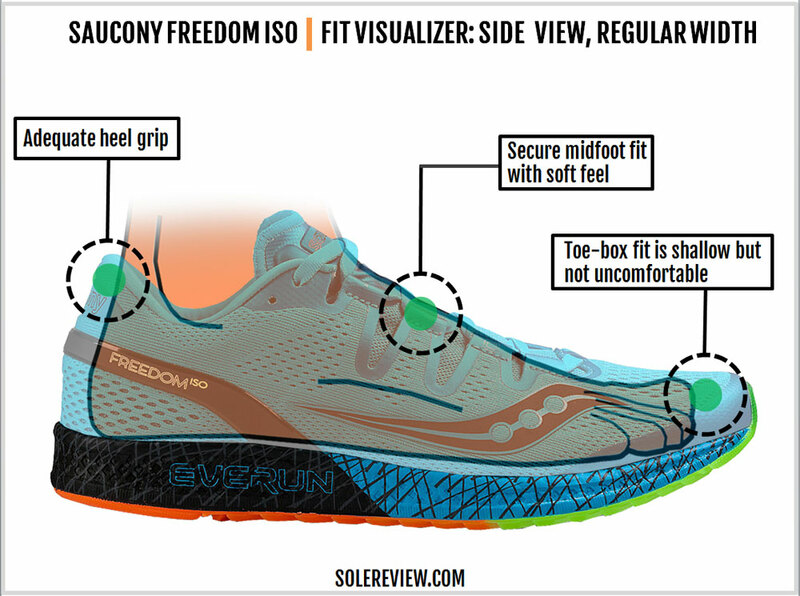 Except for a couple of minor complaints, it’s smooth sailing for the Saucony Freedom ISO. The $160 price is a high barrier to entry and is also higher than the industry average. After all, adidas sells many full-length Boost shoes for far less. The Boston Boost is $120, and the Glide Boost (and now Supernova) is $130. One could argue that Saucony uses a fancy outsole made of translucent rubber. But then, adidas uses Continental branded rubber outsoles, the first generation of which was so durable that they are likely to show up intact in an archaeological dig millions of years from now. 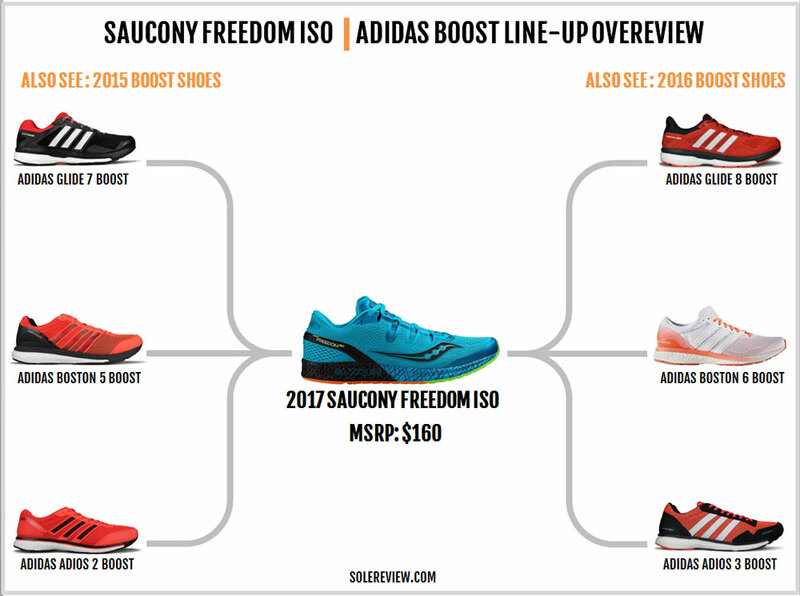 The bottom-line is, the Saucony Freedom ISO is overpriced on a materials-only basis. 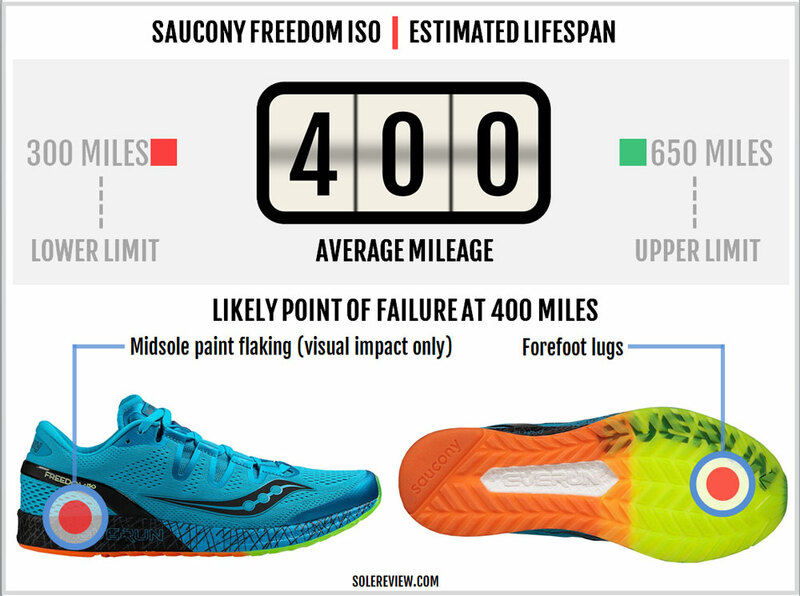 At this moment, the Saucony Freedom is available only in a single width. The upper fits narrow, so an optional 2E (wide) width should be standard. Maybe this will change in the coming months, but right now a single-width Freedom ISO isn’t ideal. Lastly, the midsole sidewalls are painted. This will eventually lead to paint chipping off the foam and impacting the Freedom’s visual appeal. The paint (or its absence) has no effect whatsoever on the performance, though. That’s all the nit-picking we could do on the Freedom ISO. On the other hand, the Freedom ISO has a lengthy list of positives. Versatility is the Freedom’s strongest suit; the shoe feels great for easy-paced long runs as it does for faster workouts. The midsole stacks aren’t very high, and yet the midsole is packed with superlative cushioning. And all of that is wrapped in a footwear package with a lithe and athletic personality. At an overall level, the Freedom ISO has an excellent balance of cushioning, springy responsiveness, economical roll-offs, support and ground feel. A mere 9 ounces/ 255 grams for a running shoe with a full-length Polyurethane midsole and a durable rubber outsole is no small feat. That does not mean that the upper is flimsy; the engineered stretch mesh material with an inner sleeve is comfortable and seemingly durable at the same time. The upper has a performance focused fit character marked by an overall snug feel. And yet, the upper feels soft to the touch, and the elastic materials accommodate a variety of foot shapes. It is heartening to see Saucony take the high road, and introduce their first full-length Everun shoe in a pure performance package. Seeing what the expanded Polyurethane material can do to the ride experience, brands can be easily tempted into making quasi-running shoes with a mainstream appeal. Even with the Freedom ISO’s unparalleled versatility, you might need other wingmen. The Kinvara has long been Saucony’s 4 mm-drop standard bearer, and at 7.7 Oz/ 218 grams, it is a much lighter shoe than the Freedom. There are a couple of noticeable differences between the two. The Freedom’s ride and fit feel smoother than the Kinvara. The Kinvara has a split outsole and a foam midsole, which doesn’t result in the same, seamless ride experience. The K7’s upper fits narrower in the forefoot and midfoot due to the static mesh and the Pro-lock band. So why should you get the Kinvara then? There are two reasons. The first is the Kinvara’s much lower weight. The second reason is the thicker stack height; the Kinvara is thicker on both ends by an additional 3 mm. Just in case you wanted another 4 mm offset shoe which ‘feels’ more padded, then the Kinvara is the answer. 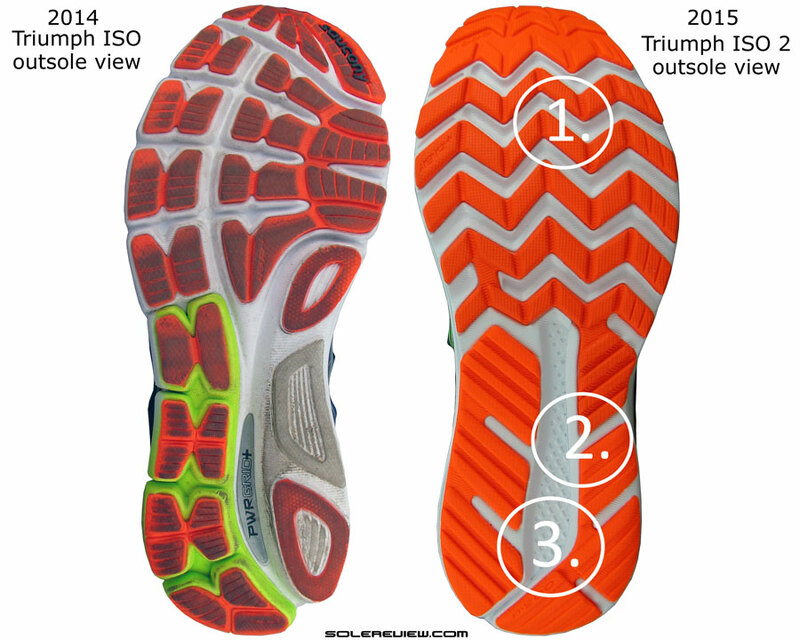 If you wanted even more midsole thickness, then the Triumph ISO is your best bet. It has a relatively massive heel stack of 30 mm (11 mm over the Freedom) and a 22 mm forefoot. The extra midsole is accompanied by a higher offset of 8 mm and a 10.7 ounce weight. Considering what the Everun midsole is made of, the only choices outside Saucony are available in adidas’ Boost assortment. An important thing to note here is that as soon as you exit the Saucony playground, you have to leave behind low heel drops as well. None of the adidas Boost shoes have a lower heel offset, and most of them lie in the 10 mm range. Not that it is a deal-breaker, but some runners are very particular about what the drop is. We won’t recommend going for any of the full-Boost models like the Ultra. Instead, you should get the Glide Boost on the cushioned side and the adios 3 Boost for faster days. If we had to narrow it down to just one shoe, then get the adios 3 Boost alongside the Freedom ISO.